Combine the potato, leeks, egg and flour in a mixing bowl. Season with salt and pepper and mix together everything thoroughly. Heat the oil in a frying pan on high heat. Form the potato mixture into patties and set them in the pan. Cook for about three minutes, then flip them with a spatula to cook the other side for a few minutes. The pancakes are done with each side is a nice shade of golden brown. 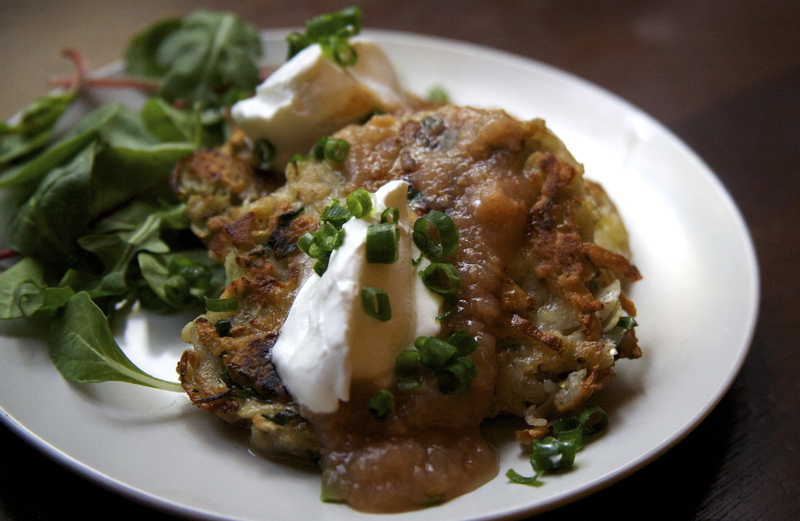 Serve immediately, topped with sour cream, pear sauce, and scallions. Pear sauce sounds like a great idea – thanks for the inspiration!